This book is an overview of replication technology for micro- and nanostructures, focusing on the techniques and technology of hot embossing, a scaleable and multi-purpose technology for the manufacture of devices such as BioMEMS and microfluidic devices which are expected to revolutionize a wide range of medical and industrial processes over the coming decade. The hot embossing process for replicating microstructures was developed by the Forschungszentrum Karlsruhe (Karlsruhe Institute of Technology) where the author is head of the Nanoreplication Group. Worgull fills a gap in existing information by fully detailing the technology and techniques of hot embossing. He also covers nanoimprinting, a process related to hot embossing, with examples of actual research topics and new applications in nanoreplication. 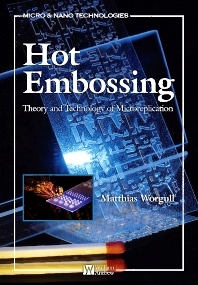 *A practical and theoretical guide to selecting the materials, machinery and processes involved in microreplication using hot embossing techniques. Engineers and students involved in microreplication. Polymer processors and polymer developers.